Checking out their upcoming titles, all in a sweet trailer of nostalgia. As with Microsoft’s tour of the US, Nintendo is also stopping around the country to promote their line of Wii U and 3DS titles. Last Thursday, we scheduled a meet-up with them to discuss some of their upcoming co-op games and get a crack at them ourselves. Our trip out to the outskirts of Philadelphia, PA proved to be quite valuable in getting a better idea of what sort of co-op content is coming out of Nintendo. Along with the main games we’re be keeping an eye out for, like Super Mario 3D World, Donkey Kong Country: Tropical Freeze, and Sonic Lost World, other titles like Pikmin 3, The Legend of Zelda: A Link Between Worlds, and Wii Fit U quickly grabbed our attention. We also had the pleasure of trying out the upcoming 2DS handheld for ourselves. After about 2 months since Pikmin 3 was released on Wii U, Nintendo recently began to roll out their planned DLC’s for the months ahead. The “Collect Treasure Pack” recently arrived on the eShop, adding a total four new challenges to the “Collect Treasure!” co-op Mission Mode, as well as a free challenge to play regardless. The representative reiterated that even more DLC’s are currently in the works to be released, though no official date was specified on them right now. The possibilities for all the DLC content, however, are still up in the air, so who knows what other co-op ideas might come Nintendo. From day one of playing Pikmin 3, I had high hopes that a co-op mode will be added to the Story Mode at some point, so I thought to ask if they could comment on that aspect. Unfortunately, they were comment on that. Still, I gave it a try for all our Pikmin fans out there. 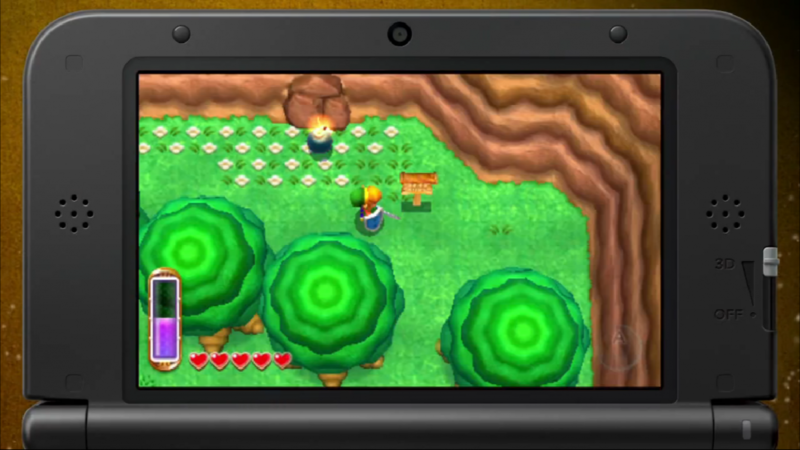 We also got a hands-on look at the upcoming Nintendo 2DS handheld device, all while playing the second of the Legend of Zelda titles to hit this year: A Link Between Worlds. From my experience owning a 3DS XL, I can safely say that this new addition to the DS family is a pretty decent one; though we were skeptical at first. The build of it fit snug in the palms of my hand, with my fingertips easily reaching the enlarged L and R buttons very comfortably. The stylus pen was placed in almost the exact same location as the 3DS, but the Start and Select buttons have been moved towards the right-hand side of the bottom screen to accommodate players. The only thing that I was really disappointed with here was the noticeable lack of screen quality; comparative to about the DS Lite quality. Still, for the generous price point of the system ($130) and with full compatibility to all 3DS/most DS games, it will definitely sell with the young gamer audience it was intended for. Grab it this weekend on October 12th! My being a huge LoZ fan didn’t change the fact that this game plays much smoother than any of the other modern, handheld Zelda titles out there. The frame rate was perfect and the attack/movement actions I made, such as swinging my sword and striking an enemy, were spot on. I also enjoyed the addition of the “magic meter” that sort of acted like a stamina bar; my bow and arrows never depleted, only my magic from my ever refilling magic meter. The game truly felt like an updated version of A Link to the Past from the SNES days. I’m very eager to explore the game more this coming November 22nd. Finally, we got to try out the upcoming Wii Fit U many are waiting for. For those that haven’t heard: don’t worry about purchasing another Wii Fit balancing board. There is no new board being introduced to replace it, nor is it fully required, but there will be a fully packaged version available. A new device called the “Fit Meter” will be available to use in conjunction with your workout sessions and contributes to your Wii Fit U records. The device attaches to your belt will allow it to record many aspects of your daily routine and workouts, such as steps taken, distance traveled, burned calories, and my personal favorite, changes in altitude. This was implemented to better calculate when a person moves to a higher/lower elevation, such as running up a hill or walking down the stairs. Furthermore, Wii Fit U will allow people to create their own custom communities via the Miiverse, to either workout with others over or keep members motivated. There are also a ton of new workout games and exercises to experience this time around, with players allowed to put them into customized workout routines. I had the chance to use both the Wii balancing board along with the GamePad to cater food to people; using the GamePad as the tray for balancing the food and the board to run the food over to the guests. It may have been silly to watch me play it, but I had a ton of fun doing it and got decent exercise as well. The free digital version of this releases on November 1st. That’s it for the general Nintendo overview. Stay tune for more on our impressions with Nintendo’s upcoming, flagship co-op titles.